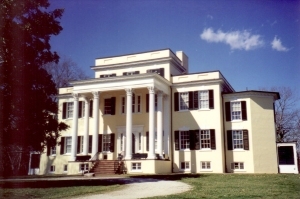 This property of the National Trust for Historic Preservation is a classic example of the Virginia plantation life in the Piedmont. The building was originally built in the early 1800s by George Carter, the great grandson of Robert “King” Carter of the Northern Neck. The three-story mansion features two octagonal staircase wings. Carter's son sold the mansion in 1897 to the founder of the Washington Post. In 1903, ownership passed to William Corcoran Eustis, who began an extensive renovation. In 1965 the family gave the mansion to the National Trust for Historic Preservation. It was designated a National Historic Landmark in 1972. Oatlands is the focal point for many outdoor activities. The annual Point-to-Point equestrian events attract thousands of visitors each April. Other annual events include May's Sheep Dog Trials; June's nationally recognized Celtic Festival; three antiques fairs in January, April, and September; and the Christmas celebration in November and December. The site is open daily from early April through Christmas, Monday through Saturday, 10 a.m. to 4:30 p.m.; Sundays, 1 to 4:30 p.m. There is an admission fee.